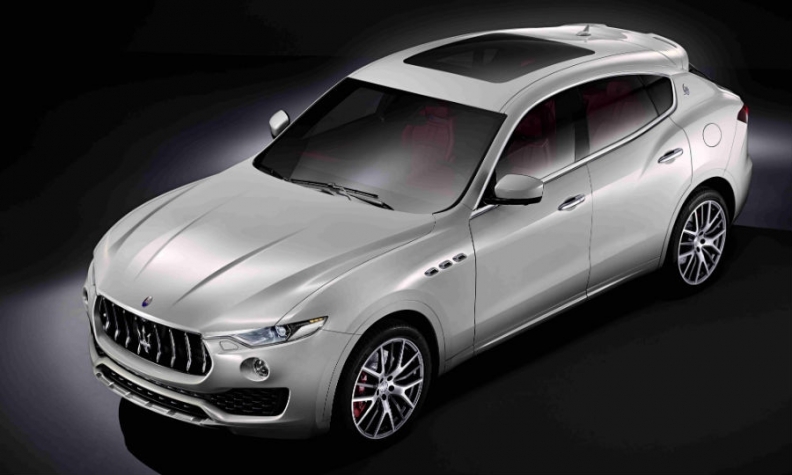 A second Maserati SUV would sit below the Levante, shown. TURIN -- Maserati plans to launch a second SUV based on Alfa Romeo underpinnings by 2020, Fiat Chrysler Automobiles CEO Sergio Marchionne said. The model will be positioned below the Levante, Maserati's first SUV, and will help the brand to reach 70,000 to 80,000 vehicle sales a year, Marchionne said. Maserati's volume rose to 36,000 from 23,900 in the first three quarters, helped by full availability of the Levante. The new SUV will also help Maserati to boost annual earnings to 1 billion euros, Marchionne told financial analysts on a third-quarter earnings call on Tuesday. The SUV will use Alfa Romeo's Giorgio rear-wheel-/all-wheel-drive platform that also underpins Alfa's Stelvio, which went on sale this year, although its powertrain likely will be unique, Marchionne said. The Levante is based on the same platform as the Ghibli sedan. With a second SUV, Maserati would be taking a play from rival Porsche's book. Porsche has expanded its lineup beyond traditional luxury sports cars, adding the Macan as a smaller alternative to the Cayenne SUV, as drivers in major markets increasingly demand SUVs and crossovers. The Maserati SUV would also be a higher-priced rival to the BMW X3, Audi Q5 and Jaguar F-Pace. In the third quarter, Maserati's earnings rose 10 percent to 113 million euros as higher shipments of the Levante largely offset lower volumes of the Quattroporte sedan, FCA said in its third-quarter earnings report. Net revenue fell 6 percent to 821 million euros primarily due to negative foreign exchange and lower shipments to China. During the analysts call Marchionne confirmed that Maserati has been slowing production of the Levante to "align output with the market demand." FCA finance chief Richard Palmer said the company expects a strong fourth quarter for Maserati, especially in North America. Vehicle sales rise strongly in the autumn in the U.S. as automakers introduce new models for the following year.